So pleased to hear that you are working on your SAL tonight...can't wait to see where you're up to! 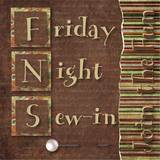 Love the idea of Friday Night stitching...if only my kids would go to bed early enough LOL! Btw, your blog is doing very strange. Pictures are enlarged enormously and are on your post several times. I will have to stop back to see your progress on your GJ Friday Night Sew In.